Erica maceration oil in apricot kernel oil. Allows you to lighten the dark spots of the skin. Erica maceration oil in apricot kernel oil. Allows you to lighten the dark spots of the skin. How to use: only at night and far from exposures to light. My opinion: I got some dark spots on my right knee from a bad burn by waxing some months ago. I tried several commercial products to lighten these spots but I have noticed just small improvements. I’vee been using the anti-oil stains Sydella Laboratoire en Provencere for more than a month consistently, every night before going to sleept and my spots are greatly reduced. This product contains all-natural ingredients, such as: – The hazelnut oil apricot from the action elasticity, emollient and protective; the heather with antiseptic and anti-inflammatory properties. – The essential oil of lemon with excellent antiseptic, purifying and lightening properties; – The essential oil of rosemary, with ‘astringent, purifying and toning property. Among the ingredients we also find the rosemary extract , which is especially good for its being healing, antimicrobial, astirigenti and purifying. It has a delicious fragrance, easily applying and it’s easily absorbed. Remember to apply before going to sleep and during the day: besides, it’s better to protect darks spots from sunlight using an anti-UV protecion. As I told you noticed great improvements, and i’m quite sure that if i will continue using this product with consistency my skin will certanly thank me. As you know, I have marks on my legs due to the squeezing of ingrown hairs, so I wanted to try products that attenuassero them to me. Already from this site, I had tried another regenerating oil stains and scars, which to be honest has worked. Within a short time the spots were lightened a bit. But, I, hard-headed I wanted to accelerate a little time and I took other products including this oil. First has a delicate Lavender scent, bearable by everyone as it is almost odorless. 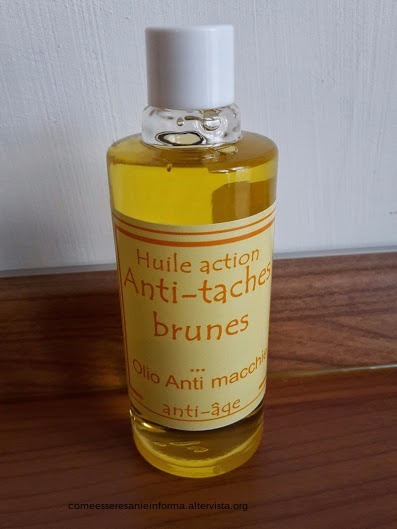 Lyliane M. on 03/15/2019 Huile que j'utilise contre les taches brunes, très bon produit.